St Jerome Church, Mapusa for the feast of Our Lady of Miracles, these otherwise quiet roads are buzzing with activity. Every inch of the land is occupied by stalls, stone carvers, carpenters and sweet marts. Considered one of the biggest markets in Goa, Mapusa has been the hub for Bardez for centuries and this fair has been a part of one of the most popular feasts, Milagri Saibinn. 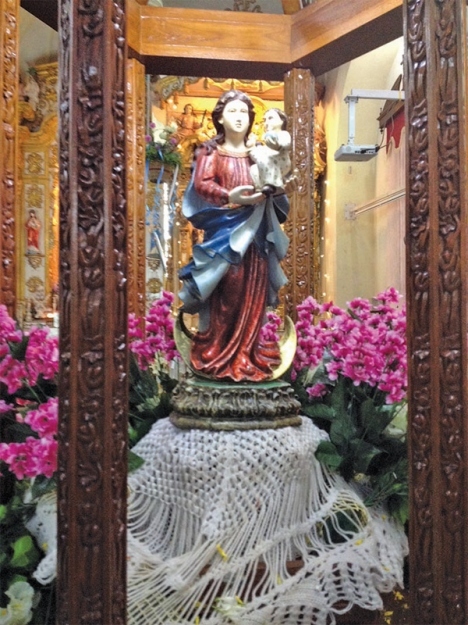 People flock to Mapusa for the feast of Our Lady of Miracles, some for the novenas, for the high mass of the feast and even after the feast for the next few days when the statue is placed for veneration. After the vespers, the statue of Our Lady of Miracles is placed outside especially for devotees who want to pray for petitions or have returned with hearts filled with gratitude towards standing gracefully carrying Infant Jesus in her left while blessing her devotees in the right hand. The church feast falls on the Monday following the third week of Easter and is very important festival for both Hindus and Christians alike who attend in large numbers. The theme also known as ‘Vixoi’ for the feast is ‘Kristacho Mog: Milagris Saibinni Porim, Amkam Thar dinam’. The feast day will be celebrated on April 16, 2018 at St Jerome Church with masses being held at 5am, 6.15am, 7.30am, 8.45am (English) and 4pm and 5pm with the High Mass at 10am which will be concelebrated by Fr Henry Falcao, Director of St Joseph Vaz Spiritual Renewal Centre, Fr Dennis Fernandes, Parish Priest of St Jerome Church, Mapusa, Fr Xavier Estibeiro and Fr Dylon Clive D’Costa, Assistant Parish Priests and Fr Thomas Vattukulathil. The church of St Jerome was constructed in 1594 and was dedicated to St Jerome but with the feast of Our Lady of Miracle gaining more popularity, it has since been re-dedicated to Our lady of Miracles. The sisters of Handmaids of Christ have been providing oil for the feast. They handle the stall and sale of oil which is poured on the statue. Devotees offer oil in spoons, container and even small gallons according to their promises. The oil is even taken home in small containers by the devotees. The statue for pouring of oil is placed out on the vespers and will remain there till April 29, 2018. The stall will be open from during the novena days till April 15, 2018 from 6.30am to 9.30am and from 5pm to 7.30pm. On the feast day (April 16), it will be made available from 9am to 12 noon and 3pm to 9pm. Agnes Fernandes, proprietor of Café Aurora in Mapusa, has been celebrating the feast with family and friends. “I am very excited about the feast. I attend the first mass in the morning and whenever I go for the novenas, I join the queue to pour oil on the statue. It is a big day for us and we prepare delicious food for our relatives and friends to celebrate our happiness and give thanks to Our Lady of Miracles. Every year, we donate snacks for the fete in the evening. Many Catholic shopkeepers donate something for the feast,” says Agnes, who will be preparing three types of snacks for the evening program. Both Catholic and Hindu devotees stand in long queues patiently as they silently say their prayers to Our Lady of Miracles. This practice has been followed for generations and still followed fervently. Rupa Morajkar along with her siblings always accompanies her mother, Reshma to pour oil on the statue. Living right next door to the church, the family considers this as an annual ritual. “I have been going to Milagres Saibinn since my childhood and we have not missed a single year. Whenever we are free, we stand in line and wait for our turn. We go soon after the feast because the idol is out only for a few days,” says Rupa. In the evening of the feast day, John D’Silva will be staging his tiatr, ‘Porzoll’ at 7pm. On April 17, 2018 from 7pm onwards, there will be a performance by students of Crescendo Music School, exhibition of local talent by Mapusa Parishioners, a performance by Kerryann Valerie Albuquerque, winner of Nightingale of Goa and Finalist of Goencho Avaz 2017, followed by the live performance by the band Noronha Brothers. On April 18, 2018, there will be a performance by Lawry Travasso, an exhibition of local talent by Mapusa Parishioners featuring Goa Gymnastics Association, Mimikry Artist, American Auction by Fr Dylon and performance of live band, 15AG. All programs will be held at the St Jerome’s Church Compound, Mapusa.